What is it about Bristol? We hail from Brighton and while our scene is reasonably healthy its hard to not look enviously West from time to time. Whilst London undoubtedly leads the way with many artists and clubbers gravitating towards its congested streets, Bristol stands proudly independent as a bastion of all things electronically underground. 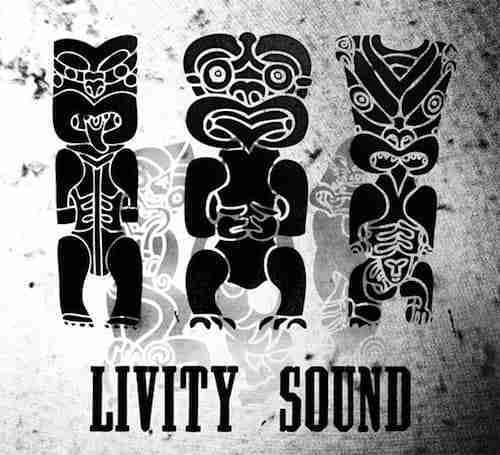 Unlike many UK cities Bristol tends to lead trends as apposed to jumping on them, and Livity Sound is the latest in a long line of collaborative projects that does exactly that. Livity Sound began as a 12 inch only series of releases that melds together Peverelist’s unique rhythms and old skool vibes with Kowtons grimey congested techno and Asusu’s distinctive more airy clarity, although this is not to say that there isnt considerable crossover in their sounds, and here in lies the secret to the engrossing Livity Sound sonic palette. As of October 21st ‘Livity Sound’ previously the domain of vinyl junkies only is released as a 2 CD Digital LP. The LP gathers together all 8 12’s plus the Hessle Audio ‘Raw Code / Junked‘ record, and like many electronic LP’s before; the prime questions is: Does it work as a cohesive body of work or is it just simply a convenient collection of tracks . First of all there is nothing new here, which means if you’re already in possession of all 8 records it is perhaps not the best use of your hard earned cash. However if like us you missed a few, and are generally not able to command fully operational 1210’s when playing out, read on. It is also important to note that the pre-release press catergorises the LP as a compilation and therefore the argument of “Does it work as a cohesive body of work” is largely irrelevant. Peverelist first came to the fore as he embraced the emerging dubstep scene in Bristol and the UK at large, the growing genre gave him a natural home for his natural affinities for dub, jungle and techno. However despite garnering considerable respect and releasing the highly regarded ‘Jarvik Mindstate‘ LP the scene began to fracture around him as the mainstream began to covert those heavy bass sounds, courting any producer who would put a wobble on it and rave it up. No doubt disillusioned by the globalisation of the term dubstep Tom Ford aka Peverelist sought a new avenue for his musical passions, Livity Sound being the eventual outcome. Taking his passion for dub and dub mixing techniques Ford has created a live hardware environment in which he and his fellow collaborators, Kowton & Asusu can organically construct and mix their music. Whilst the overtly dubstep rhythms have largely been eradicated, the sense of adventure, desire for an always moving sound palette and devastating bass have not. The LP opens with Kowton’s interpretation of the technoid ‘Beneath’ and sets the tone for whats to come with its eerie other worldly strings and clanking techno percussion powering through the speakers with destructive certainty. ‘Raw Code’ swiftly follows with its apocalyptic static opening, leading into a booming almost speed garage type sub layer, whilst schizophrenic percussion melds dubstep rhythms with techno sonics. As the LP progresses ‘More Games’ continues the bass techno template resplendent with 80’s claps and dub type live mixing as elements are spontaneously stripped in and out of the mix, giving what is essential quite a minimal sound considerable dynamic life. This trend continues throughout the entire LP with every track fighting the rules of compositional conformity with swathes of reverb and delay flooding the mix with cavenous authority only to be abruptly stripped back to lay bare the dry bones of the track. ‘Remnants’ swirls whilst ‘Sister’ takes a more linear approach all the while the tracks are high on energy and sub. ‘Erosions’ picks up where ‘Beneath’ left off as it delves further into the reaches of time and space. Asusu steps back into the fray with another take on UK techno, ‘Rendering’, and like his more linear ‘Sister’, less emphasis is placed on sub as the airy lead stab is allowed to take the fore. Overall Asusu’s work on the record appears the least organic and aggressive, however his more conventional approach gives the album its own unique evolving flow, with his relative calmness giving the album a chance to take a breath, but dont be fooled, we’re not suggesting Asusu is dishing out fluffy nonsense, far from it. As we enter the second CD of this 2 CD collection we are left with jaunty ‘Livity’ resonating in our ears, only for it to be unashamedly dashed from our thoughts as ‘Surge’ & ‘Jam’ battle for supremacy. Up next is the Pev & Kowton collaboration ‘Vapours’, which takes the Raw Code template replacing blankets of static with a rasping bongo led hook whilst reaffirming the almost DJ tool feel of the album, type of stuff you could imagine Pearson Sound playing on repeat whilst relaxing at home. ‘Velez’ is more crisp straight laced techno, and a personal favourite of ours, we managed to bag this one on vinyl. ‘Junked’ is more of what we’ve described above, making decisions on favourites really just a matter of personal preference as apposed to comparing stark sonic contrasts, ‘Saltwater’ being one of those highlights for us. Like its bigger brother and the albums only real crossover track, ‘End Point’, it has a richly warm synth hook briefly penetrating the ominous layers of bass and drums. ‘End Point’ follows next with its Star Trek inspired squeaks luring us towards its late 90’s, progressive house inspired, lead hook, and is without doubt an album highlight for us. Book ending the album nicely is Pev’s take on the LP opener Beneath. The ‘Livity Sound LP’ is not so much an album in the traditional sense, more a compilation of tracks, however its no less cohesive because of it, with every track complimenting its predecessor whilst preparing us for whats coming next. Pev, Kowton and Asusu have given us a timely reminder of electronic music’s traditionally liberating roots, and in a world that now exploits it at every turn, its refreshing to feel inspired and stirred by a fresh new band of innovators.